We are being asked a question pretty routinely lately. In our Tweets and our blog posts we always exhibit an enthusiastic irreverence for certain economists, market commentators, media personalities and politicians by identifying them as “experts.” We go on to explain why what they said was silly. We have little use or respect for those whose headlines routinely contain words like “unexpected”, “surprised”, etc. We often review our past posts regarding our opinions on where the economy is headed to make sure we have had a good handle on what is going on or if we need to shift our observational and analytical methodology. Ya see, “experts”, that’s what you do if your analysis, decisions and policy aren’t working. We are pleased yet sad to say if you follow us none of the economic data that “surprises” the “experts” is ever a bombshell for you. This has led many of our readers to ask Why are the “Experts” Always Wrong? There are several reasons ranging from academically focused and financially motivated to politically goaded. In other words we must always consider the source. The financially and politically motivated crowd is, we believe, reasonably small. Advocates of the party in power will try to up-spin data and market beneficiaries have a vested interest in making any news look as good as possible. That leaves a much larger group that is just plain wrong. Why are these “experts” so easily misguided by the same data we review? We have a theory. The problem is mostly academic. Blue World employs people. Blue World principals and network resources employ lots more people. Blue World clients employ lots, lots more people. Decisions on how many are employed is partially based on a comprehensive review of the economic data released, just like many of our “experts.” The difference is we HAVE EMPLOYED REAL PEOPLE and INVESTED REAL MONEY to make businesses (our own and our client’s) successful in the private sector. We don’t just sit in cubicles and read data. We compare the data to what we see happening around us in the real world. Just driving around town or across the country and taking note of strip mall vacancies can give some great anecdotal corroboration or refutation of the spin in the headlines. Data is just that. Data. It should be used as a metric against which to measure reality. If we don’t understand how the data is gathered we are likely to make poor decisions based on it AND be at the mercy of those who do know and choose to ‘spin.’ For example, the unemployment rate dropped .1% last month. Good news, right? Not if we know how to read the report. The number of unemployed people actually rose but the sample size changed such that the number of people being counted shifted. This created an artificial improvement the percentage even though reality worsened. This is an observation, not an accusation, but I’m afraid there is a degree of estimating that goes into the BLS Unemployment numbers, and that creates the opportunity to mislead at the headline. That’s why Blue World does the monthly analysis, to remove the spin and provide actionable intelligence to business owners, managers and investors. Another example: a great deal of predictive emphasis is placed on the ADP job numbers. As the largest payroll processor in the company it is assumed that an increase in processed paychecks equals positive private sector job growth. The problem is that ADP counts all payrolls, not all workers. In other words one worker may be holding down three part-time jobs because he can’t find full time employment. This looks like three new jobs but it is only one person working! This statistic is not accounted for in the ADP report but is in the BLS release. It is called “Employed Persons at Work Part-Time for Economic Reasons.” “For Economic Reasons” means a worker wants full time work but can’t find it. It is found in Table A: Household Data of the monthly BLS report. If we see a rising trend in the ADP report and want to deduce good or bad news from it we must compare that to the trend of part-timers for economic reasons. If that trend is also rising we don’t have a good trend for private sector employment. Now, there are boatloads of economic releases that come out each week, month, quarter, year. There is GDP, the unemployment report, housing starts, consumer confidence index, new home sales, existing home sales, new housing permits, first-time jobless claims, factory orders, manufacturing index and on and on and on… What I want you to realize is that for all the data gathered, analyzed and reported on they all have just one common objective. It is to see what kind of mood you and I are in as consumers. If we can determine what kind of mood the consumers are in and what their spending patterns are we can predict which way the economy is likely headed. If unemployment is headed down, personal income is increasing and GDP is rising it is a darn good bet that good times are-a-comin’. Often times spin of the data is used to try to shape our mood rather than identify it. Those who read the detail (or our analysis) are inoculated against such manipulation. So how are the truly unbiased “experts” fooled? We have data that comes out weekly, like first-time unemployment insurance claims; monthly, like the Bureau of Labor Statistics (BLS) employment report; and quarterly, like the Gross Domestic Product (GDP) report. All too often our “experts” use the weekly type releases as predictors of the longer term data. The correlation during robust recovery and distinctly weakening times can be quite good. At times of bouncing along the bottom or flying at cruising speed, however, the predictive value predictably deteriorates! If all you do is sit in a cubicle and look at data (like our “experts”) you’re just going to be wrong due to the inconsistent and sometimes volatile nature of the more short term data. To illustrate this point the graph below shows the average number of new unemployment insurance claims (weekly) graphed against the actual number of reported unemployed people (monthly) divided by 10 to match the scale. 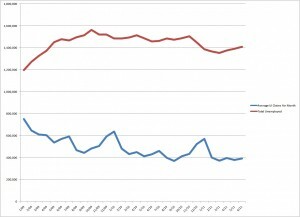 As you can see, if you were to use even the weekly average new claims (blue line) to predict the unemployed totals (red line), you would regularly be “surprised.” If you were to look for news, good or bad, in the actual weekly numbers you can appreciate that they are even more volatile and unpredictable than the smoothed-out average represented above. That’s why we roll our eyes and shake our heads when the markets throw a party or a wake every Thursday when the new unemployment insurance claims are announced. We say this analysis is not about headlines and spin. Sometimes it’s an easy thing to write and sometimes painful. Like today. The details of the report do not support the notion that the labor market is improving. On the contrary. The idea that it’s good to have 117k new jobs vs. an expected 75k in and of itself is an indication that things are bad. 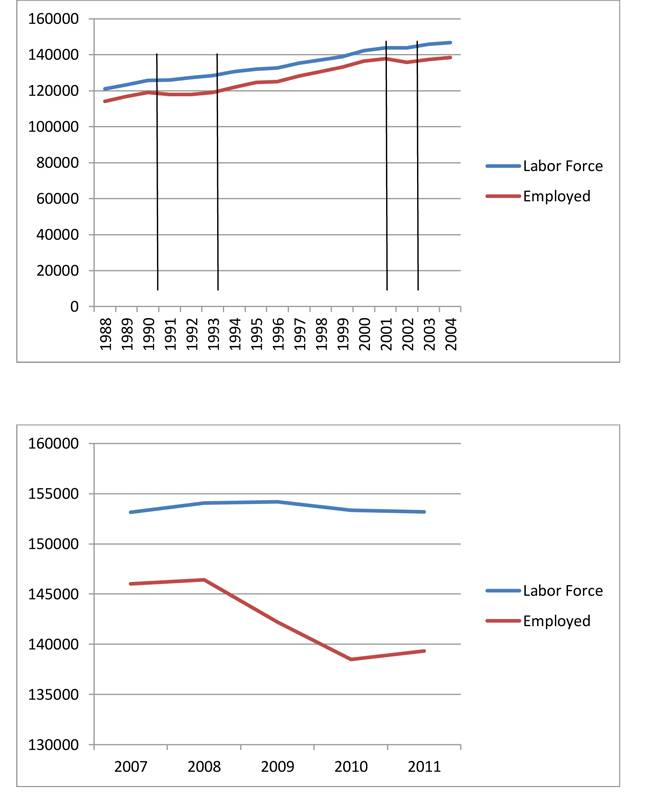 In truth, the size of the civilian work force got smaller, the participation rate fell, the number of employed people fell and the number of people not in the labor force rose. All this combines to produce an unemployment rate that is flat but will be touted as an improvement by many. GDP was poor and revised down, mass layoffs have been in the news in that last week and on the rise, consumer confidence and CEO confidence is down, earnings are very mixed and outlooks are weakening. All of the indicators affirm the lack of recovery and we have an economy still on the ropes. The markets opened with the predictable knee-jerk but at the time of writing exuberance is waning as the details of the report make their way into the collective awareness. 25+ with a bachelors and higher is still above 4%, and those working part-time for lack of full-time availability is up. Average hours worked and overtime in manufacturing was flat at 41.4 and 4.1 hours per week, respectively. As we continue to observe, policy matters. Thank you for reading and…stay tuned! There is no such thing as a jobless recovery! “What’s Wrong with America’s Job Engine?” Our Author asks. It’s hard to know where to begin with this one. How about here? There is no such thing as a jobless recovery! Jobless recovery is an oxymoron. If we are “jobless” we don’t have a recovery. It’s as simple as that. A full seventy percent of our GDP is driven by consumer spending. If unemployment is nine percent, and rising, where is the recovery? We keep telling you there isn’t one, the recession is not over and the economic data continue to bear that out. Consider the ridiculous “expert” driven GDP estimates. The first quarter was revised down from 1.9% to .4%. Then they have the nerve to suggest the second quarter at 1.3% (advanced estimate which will also be revised) was “unexpected.” These guys have a better job than weather forecasters! Of course CEO’s see no demand out there. Did we mention unemployment is over nine percent and the consumer drives GDP? GDP is a great proxy for demand so you can see it takes very little ‘smart’ to predict demand will continue to be low. The author asserts that while output, profits and the labor force have grown over the past ten years the number of employed people (jobs) has fallen. They say you can get numbers to say anything… Those assertions are utterly ridiculous as the graphics below will show. The number of unemployed people has not followed the output earnings trend for ten years. The unemployed have become so in the last two and a half years! 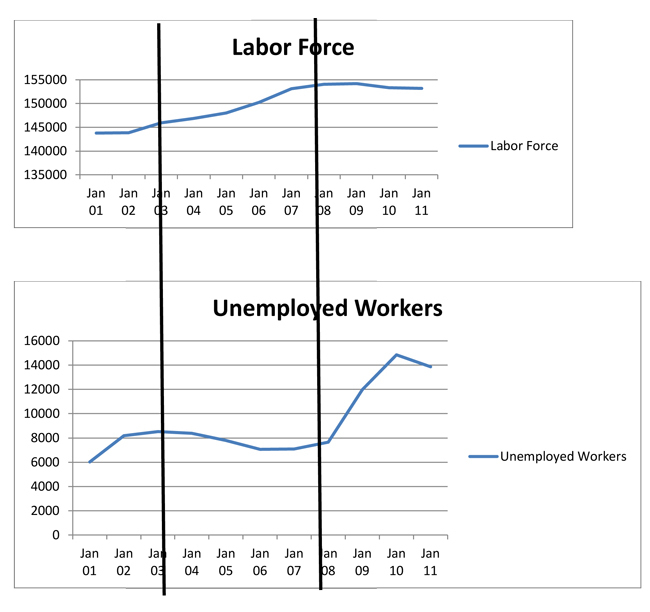 As you can see, after 2002 the number of unemployed workers actually decreased while the available labor force increased. 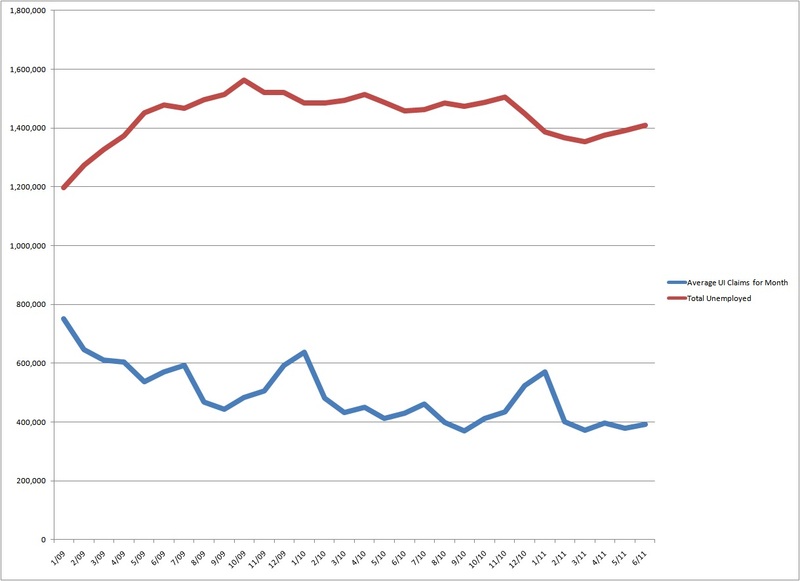 It is only since mid 2007 that the rate of unemployed people has out accelerated the increase in the labor force. Hard to deny policy and anticipation of policy affects economic activity. To say that sales have come back as a general statement is moronic no matter who says it. Can it be true in narrow examples? Sure. But we again refer you to the .4%/1.3% GDP numbers from today. Sales HAVE NOT returned. Construction and small business are not failing to hire early in the recovery because THERE IS NO RECOVERY. They were not “crippled by the credit bust.” They were, are and will continue to be crippled by a lack of demand…PERIOD. The “confidence” factor referred to by the author is based on…anticipation of sustained DEMAND, DUH. There is no “phenomenon” regarding a change in the way employers view labor no matter how many pointy headed “experts” in cubicles who’ve never signed a paycheck say there is. Business has always strived to keep costs as low as possible. That’s responsible management and always has been. Nothing new. But as technology advances the ability to do more with fewer humans continues to accelerate. Does this support the author’s conclusion that technology is part of the “problem?” NO! All that technology has to be designed, manufactured, distributed, sold and maintained by somebody. Are you going to try to tell us that the advent and rise of the PC a la Microsoft Windows™ cost people jobs? If so, please regard yourself as an expert and stop speaking. A truly “thoughtful” paragraph. May we reiterate; THERE IS NO SUCH THING AS A JOBLESS RECOVERY!! You certainly can’t call it the norm. I don’t know if our author just doesn’t know how to read a simple graph or was relying on “experts” who don’t know how to read a simple graph. Jobless recoveries are the norm? Do the ’91 and ’01 recession/recovery cycles look jobless to you? They don’t to us, either. The only divergence we see is occurring right now and is in large part due to the fact that most cyclical recessionary periods last eighteen to twenty-four months. We are moving deeper into uncharted territory every day with no indication of policy change on the horizon. That will perpetuate the pain. When will these guys understand that companies do not hire to be nice and fire to be mean? Good executives manage the size of the workforce based on demand. Managers who don’t have companies that go out of business. Managers of yesterday did not keep “unneeded” workers. A lack of technology required they keep a higher percentage of people. Even then, as now, however, necessity is the mother of invention. A firm’s first priority is to survive. Remaining employees become committed to keeping their jobs by enhancing the survival prospects of the company. They innovate, experiment and execute on new ideas that increase efficiency during and beyond the recession. Does that mean certain “jobs” won’t be recalled. Yes. But if the company is more efficient in the face of rising demand new positions will automatically be created which, of course, leads to growth which leads to new hires with different job descriptions. As to why layoffs were faster this time; data analysis continues to accelerate in speed, sophistication and accuracy. The downturn started as then-Senator Obama became the clear frontrunner in 2007. The policy priorities of his administration were obvious to those who invest real money and hire real workers before the election. In other words, businesses could see it coming sooner than in the past and reacted appropriately. “Experts” Groshen and Potter tell us when layoffs are permanent recovery is slower. They get paid to elucidate these nuggets of truth. No kidding! But the idea that it’s because it takes time to review resumes is silly. They talk of the evils of part-time and temps? When things improve for real who do they think are the first candidates for conversion to full-time employment? Could it be the temps already trained and experienced? Resumes are the bottleneck to recover? C’mon! Yes, responsible executives care about stock price. They have to answer to the owners of the company, public or private. Why the authors paint this as a negative is beyond me. An even bigger mystery is how he can suggest that flexibility and stability are competing priorities. A company that can’t be flexible can’t achieve stability. Stability is never a guaranteed constant without a commitment to flexibility. Flexibility is the currency that buys stability. Just ask Borders and Blockbuster. They continued to operate with 1980’s and 1990’s business models. Their lack of flexibility lead to fatal instability. We could go on for pages about the apparent confusion as to why a company may choose to hire overseas but we think our readers get it. We do, however, have to comment on the idea that China’s increasing wages of up to 17% of U.S. wages by 2015 will spark a mass exodus back to the U.S. We may start to see some movement in that direction but only an “expert” or one who relies on “experts” could think that a delta of 83% is insignificant when making payroll. As to the yadda yadda on difficulty hiring adequate workers, does anyone believe the sentiment “ya just can’t find good help these days” is new? At the end of the day small business is the true driver of jobs in the U.S. That’s why the notion of “too big to fail” is a travesty. Had those companies been allowed to meet their appropriate fate it would have created untold new opportunity for talented people to start over and do it better than before in businesses of every size. As it is policy has created uncertainty, fear, terrible unemployment and a solid hesitation to start new businesses or invest in the growth of existing ones and there is no end in sight. We don’t know how else to say it, folks. Policy matters. Thanks for reading and…stay tuned.